Matthew Beetschen (Organist at Dunblane Cathedral, Scotland) has made a beautiful setting of this lovely prayer by Alistair Maclean telling of the gift of this new day to us, and asking that we "bear ourselves gently towards all"; that our thoughts may be mirrors of God's thoughts. 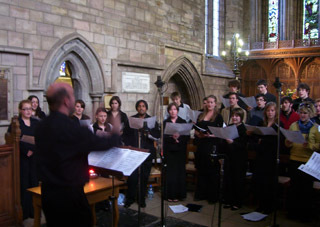 This piece was sung by the RSCM Millennium Youth Choir, conducted by David Ogden, during a live BBC Radio 3 broadcast of Choral Evensong on Sunday 2nd September 2007 from Dunblane Cathedral, Scotland. The text of this piece is adapted (anonymously) from "An Island Girl Prays upon a June Morning" in Hebridean Altars by Rev Alistair Maclean, Church of Scotland minister, Gaelic scholar, and father of the famous novelist. "here is music indeed that will give rhythm to our lives … thoughts and prayers [that] can pluck at the very strings of our heart and soul. Time and again there is a wonderful way of learning to accept the new day as a gift, a mystery and a companioning with God" (p.xii). (Although we have plenty of copies of the music, unfortunately, the book in which this text appears seems to be out of print, though you may be able to obtain it from church bookstalls or through abebooks.co.uk (its ISBN is 0-340-73557-0). This day is your love-gift to us. This dawn, we take it from your hand. yet not so busy that we cannot sing a happy song. that we bear ourselves gently towards all. …it was rather nice, I thought, to hear a short introit by the Dunblane organist - the more so because it was a lovely setting and very well sung. Beautiful, beautiful piece of music and really suits the words. Buy your copies of A Celtic Prayer here.